How to select columns in Editors and IDEs to columnar delete, insert or replace some characters ? Notepad++, Visual Studio, and some others: Alt + drag. In Kate toggle Ctrl + shift + B . In Netbeans 7.1 can select columns (Rectangular Selection) with Ctrl + shift + R . There is also a button in the code editor available. 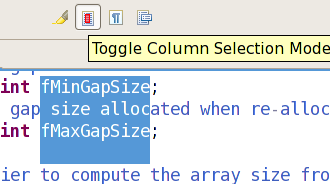 Eclipse used to need a column mode plugin to be able to select a rectangular selection. Or activate the 'Editor Presentation' action set ( Window > Customize Perspective menu) to get a tool bar button for toggling the block selection mode. Columnar selection is a mode you enter and leave: in other words, Eclipse switches into a mode where all mouse selections have to be columnar and you stay in that mode until you switch back (by using the same command again). It's not like other editors where columnar selections are enabled only while certain keys are down. In vim column visual mode is Ctrl + v. If that is what you meant? ctrl + shift + â"
ctrl + alt + â"
In emacs, you can use rectangles for this, where a column is a rectangle of width 1. Kill the text of the region-rectangle, saving its contents as the "last killed rectangle" (kill-rectangle). Delete the text of the region-rectangle (delete-rectangle). Yank the last killed rectangle with its upper left corner at point (yank-rectangle). Insert blank space to fill the space of the region-rectangle (open-rectangle). This pushes the previous contents of the region-rectangle rightward. Clear the region-rectangle by replacing its contents with spaces. Replace rectangle contents with string on each line. (string-rectangle). In IntelliJ IDEA, you can switch the selection mode with Alt + Shift + Insert combination. You can also column select by keeping the middle mouse button (i.e. the scroll wheel button) pressed and dragging. Ctrl + Shift + B also allows you to add more columns by simply clicking anywhere and paste it. I used this when saving text files I copied from Google Translate as a side-by-side view. This feature is not available in older versions of Netbeans (up to 7.1) and the plugin is not supported anymore. A plugin is now available for NetBeans 6.9. In TextMate with the mouse: start a selection and keep alt pressed while you move the cursor. Without the mouse: first select normally using â§ and arrows then hit alt and move the cursor. in Notepad++ , you can select a particular column holding ctrl + alt + shift and then left click mouse button and drag to select. Go to left top of the page. hold "shift key Now use right arrow key to select column. Now click "down arrow" key. And the entire column will be selected. In MCEdit toggle Shift+F3 (ie F13) or F9->Edit ->Mark columns. P.S. In this case, MCEdit is an editor written for the Midnight Commander. Or use your own keys. If you're using Nedit under Cygwin-X (or any platform for that matter), hold down the Ctrl key while selecting text with the left mouse. Additionally, you can then drag the selected "box" around in an insert mode using the depressed left-mouse button or in overwrite mode by using Ctrl+left-mouse button. With the keyboard: press Alt-\ (Opt-\ in Mac OS X) to toggle between rectangular and normal selection mode; then use Shift plus arrow keys to extend selection. You can switch back to regular selection mode with another Alt-\ (Opt-\ in Mac OS X), if desired. With the mouse: Either use Alt-\ (Opt-\ in Mac OS X) as above to toggle rectangular selection mode, then drag as usual; or Ctrl-drag (Cmd-drag in Mac OS X). You can switch back to regular selection mode with another Alt-\ (Opt-\ in Mac OS X), if desired. Actually, you can even make a non-rectangular selection the normal way and then hit Alt-\ (Opt-\ in Mac OS X) to convert it into a rectangular one. With the mouse, Left-Click + Alt + Drag. Note that if you first use Alt, and then Click-and-drag, it does not work (at least for me). Ctrl+Alt instead of Alt also Works. For pure keyboard, no mouse, enable Block Select Mode with Ctrl+Q, B. Or use the sequence Alt, C, B, to do it via the Configure menu. Warning 1: if Word Wrap is enabled, then Block Select Mode will not be available (which is somewhat logical). First disable Word Wrap. This was causing me some trouble, and this gave me the answer. Warning 2: if you mean to insert text in every selected row by typing, you have to use Edit, Fill Block. Other editors let you type in directly. 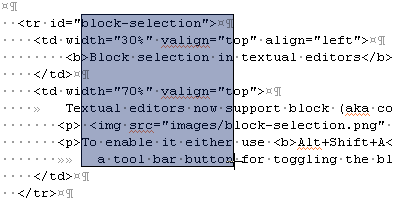 In Flash Builder (v 4.5 and up), and Aptana Studio (at least v 2.0.5) there is a toolbar button to toggle block select. It is between the 'mark occurrences' and 'show whitespace characters' buttons. There is also a Alt + Shift + A shortcut. Not surprisingly, this is basically the same as for Eclipse, but I'm including here for completeness.